If one came to Monterey to study its history and importance to California, where would you start? What one place contains all of the significant history of California’s First Capital from its occupation by the native Ohlone tribes, to its discovery by Europeans about the time of the founding of Jamestown in Virginia, through four national and state governments, to the present day tourist mecca and thriving seaside Charter City? What site was the scene of the only battle between sovereign nations in California history? Colton Hall? San Carlos Cathedral? Cannery Row? The Custom House? No. None of those places quite fits the task. Instead, you would start at the Presidio Hill overlooking the Harbor and Monterey Bay—the site where Sebastian Viscaino claimed the land for the King of Spain in 1602 and named the area “Monterey”. It’s here where the history of California commences and evolves over 250 years to our present day. This prominent hill has participated in or seen the evolution of California from the start. 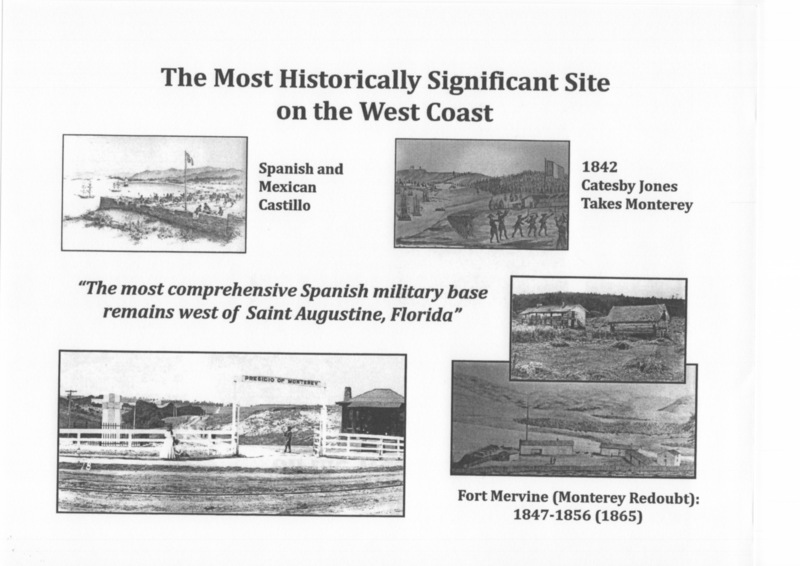 It has been called: “The Most Historically Significant Site on the West Coast” by professional historians. It is now called the Lower Presidio Historic Park—a beautiful place in the middle of Monterey that overlooks the Harbor and yet is almost unknown to its citizens and probably the least visited historic site on the Monterey Peninsula. As a consequence of this fact, the Old Monterey Foundation decided by unanimous vote of its Board in November 2014, to change this deplorable situation. We have undertaken to be the catalyst to develop the historic Park through a multi-year effort to make the Lower Presidio Historic Park, the centerpiece of our history and the jewel of our Park system. The City of Monterey acquired the approximately 26 acres of public land that comprises the Lower Presidio from the Department of the Army through a 50-year lease entered into in 1996. The area is generally described as bounded by the Sloat Monument up the hill to the southwest and Lighthouse Curve from Foam Street to Pacific Street. The leased land contains several landmarks that are eligible or presently listed on the National Register of Historic Places. 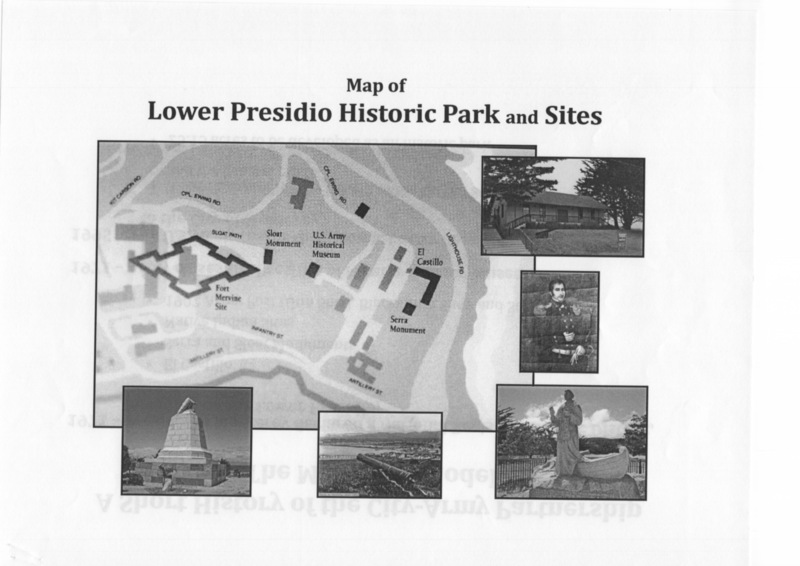 It is named the Lower Presidio Historic Park in both the lease and the Master Plan but, 18 years after signing the Lease, not even the name appears on a recognizable sign on the site. into the modern era from the turn of the century when the Presidio became primarily a military training facility in 1902, and leading up to the present day Defense Language Institute. All periods either through archeological evidence or presently existing landmarks can be exhibited and interpreted to the public with some development. 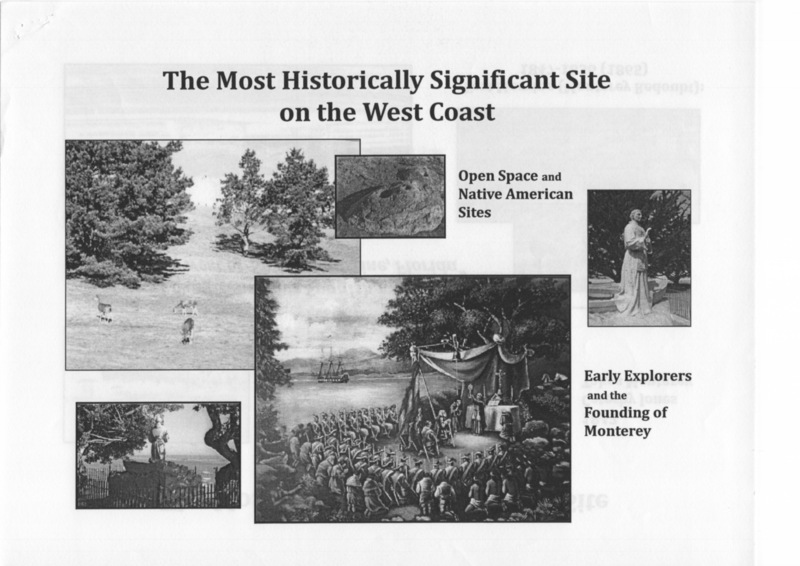 The Lower Presidio Master Plan was prepared in 2002 by joint effort between the City and the Department of the Army, as required by the Lease. The Plan collates the history and outlines the improvements that can be made to the site to fulfill its historic heritage and park purpose. It projects a total cost of nearly $3 million to fully preserve remaining buildings and artifacts on site. But items such as historic fencing (rather than cyclone fence), pathways, benches, and interpretive signs and monuments are relatively inexpensive compared to the total projected cost of the plan, which can be easily phased to permit a incremental approach to improvements that we estimate can be accomplished with multiple and serial grants or funding over the next five years with your help. Nothing has happened at the site since the 2002 Master Plan was written. 18 years of the 50-year lease have expired. Budgetary constraints of the City of Monterey have in the past precluded development and we suppose that would be the case into the future. So it is time for a private partner to step forward to organize and press the development of the Park, with the aid of charitable and preservation funds to be solicited through grants and donations as a tax-deductible opportunity. Considering the spectacular views and setting for recreational use and historical interpretation and tourism, the time has come to quantify and prioritize improvements so that we can realize the amazing potential of the Lower Presidio Historic Park. With the 200th anniversary of the Bouchard Raid coming up in 2018 and the 250th anniversary of the founding of the city of Monterey in 2020 looming, a sense of urgency is evident if we are to achieve the goal of having a useable park for the public, and meet the expectations of what these celebrations might mean to the community.